I’ve been spending a fair amount of my blog time on composers lately. Have you noticed? Well there are three reasons for that: (1) I’ve been swamped with “life” lately which has hindered my ability to finish the posts that I’ve started on other aspects of piano study and Piano Discoveries, whereas I have a lot of materials on composers at my fingertips which make for convenient posts (I hope you appreciate honesty! ), (2) I’ve been rather nostalgic for my university days and all of the wonderful opportunities I had there — to learn and perform music, to study the many composers and compositional styles, etc. and (3) because music history is a very important aspect of piano teaching/learning. Oddly enough many piano teachers ignore this aspect of music study. It seems that piano performance skills come first, followed by theory (if you’re fortunate enough to have a teacher who emphasizes that), then basic history regarding the specific style or composer of a specific piece being learned, and then only sometimes music history on a larger scale. I believe that exposure to all kinds of styles, composers, and levels of music is important for piano students. Once my students have learned the very basic piano skills I start to introduce composers and larger works so that students can begin to become familiar with various musical styles and composers from the beginning. Pieces that are too difficult for a student to learn shouldn’t be ignored; rather, exposure to grander and more complex music will give students the understanding and excitement for what can be — what they can learn to do if they practice! 🙂 Additionally, students will start to recognize works of music all around them, such as in movies and commercials, on the radio, at the grocery store, and so forth. This is an important listening and processing skill! So…with all of that in mind, here is a post about a wonderful composer and an absolutely fantastic piece which I studied in college! I hope that you and your students will enjoy. Camille Saint-Saens, born in Paris in 1845, was France’s leading musician for nearly seventy years. He began his musical study of the piano at the age of five, and at six he began to compose. 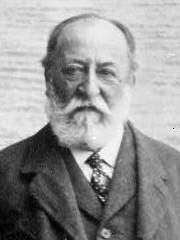 Saint-Saens gave his first public performance at the age of eleven, where he played a Mozart and a Beethoven piano concerto. He also studied and mastered the art of performance on the organ. He was well-known for his sills as a sight-reader and an improviser. 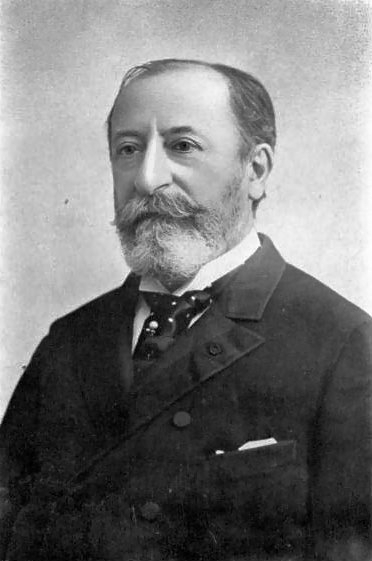 Saint-Saens began his professional career as a church organist at St. Merry in Paris, in 1853. 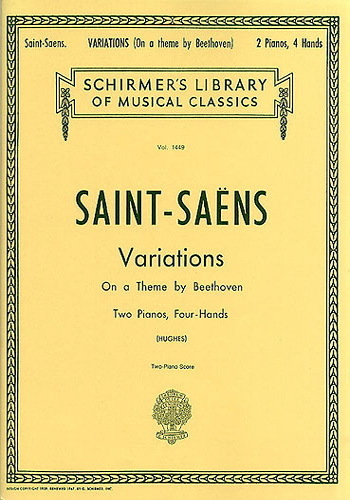 Saint-Saens “Variations on a Theme by Beethoven,” Op. 35 is a duo, composed for two pianos, four hands. The theme is taken from Beethoven’s Sonata in E-flat, Op. 31, No. 3. It is from the Trio section of the Minuet and Trio movement. The piece is lively and technically demanding, requiring exactness with the rapid alternating chords between the two pianos. Throughout the piece the two pianos trade-off between playing and waiting, in a “cat and mouse” fashion. This results in an exciting piece to observe in performance. (1) the first variation uses the technical device of scales. The first piano plays a series of scalar passages while the second piano accompanies with chords, then the piano parts reverse with the second playing the scales and the first accompanying with chords. (2) The second variation is a slow, lyrical movement, which requires the performer to play octaves throughout. (3) The third variation is a restatement of the theme, except it is in reverse order. The original theme had two chords ascending followed by a lyrical passage that descended. In this third variation, the two beginning chords descend and the lyrical passage ascends. (4) The fourth movement has rapid repeating chords, each piano playing a beat and resting a beat. A lively interplay between pianos results. (5) The fifth variation is in a slow tempo and contains much ornamentation, especially trills. It is full and rich in harmonies and includes many chords. (6) The entire sixth variation is made up of scales. One piano plays a scale, ascending and then the other piano responds by playing a scale, descending. (7) The seventh variation has many staccato chords, followed by long sustained thirds. (8) The eighth variation is a restatement of the opening introduction. (9) This is then followed by a fugue for the ninth variation. (10) The tenth and final variation distributes the melody between the two pianos, all in chords and octaves. The piece ends with octaves and chords in a presto tempo and fortissimo. An exciting ending to a wonderful piece! Your composer notes are wonderful, and what a great touch to include a composition! I love it!